While the Church celebrates the feast of St. Dennis today, the Dominican Order celebrates the feast of our beloved brother, St. Louis Bertrand, patron of our novitiates and novice masters and novice mistresses. In our monastery the novitiate sisters have the day as a feast day! The what and how (and of course that means what treats!) is pretty much left up to the novitiate sisters...within reason! Because it is a Friday, Sr. Mary Martin dispensed the sisters from the fast. So, you are probably asking yourself, who is this St. Louis? Never heard of him! St. Louis Bertrand was born in Valencia, Spain on January 1, 1526, and entered the Dominican Order in 1544 against the wishes of his parents. 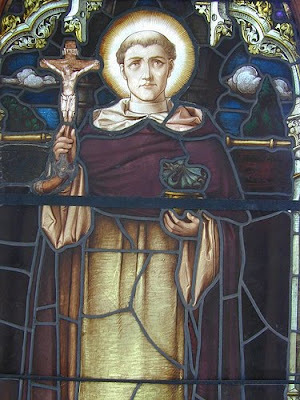 He exemplified the ideals of Dominican life so well that he was appointed Master of Novices. Combining an austere life with zeal for spreading the Gospel, he asked to be sent to the farthest parts of the Americas and in 1562 was sent to what is now Columbia. He was given the gift of communicating with the Indians in their own tongue and with the encouragement of Bartolomé de las Casas defended their rights against the Spanish conquerors. He returned to Spain in 1569 and again assumed the position of Master of Novices. He died at Valencia on October 9, 1581. 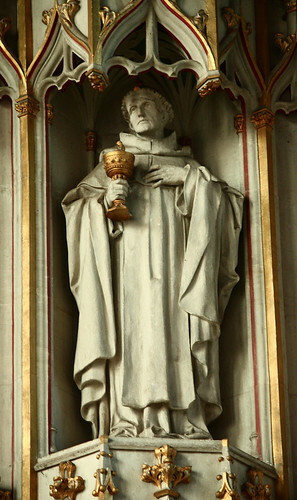 St. Louis Bertrand is the Patron Saint of novitiates and formation personnel. In Christian iconography, St. Louis Bertrand is often portrayed holding a chalice from which serpents are emerging. In the other hand, he displays a crucifix with a pistol at its base. These articles call to mind two stories from the great saint's life when God miraculously saved him from attempts on his life by vile would-be assassins. The first recalls the story of Brother Louis' missionary preaching in South America. A native priest, showing his jealous contempt for our saint, gave him a chalice of poison at the Holy Mass. Louis made the sign of the Cross over the toxic potation, and serpents sprang from the chalice, thus revealing its true contents and saving his life. The second object - the crucifix/pistol - recalls another account of near-martyrdom in the life of St. Louis Bertrand. Set upon by a crazed gunman -- we like to think it was one of his novices, but who knows -- St. Louis calmly made the conquering sign of the Cross. With this most basic gesture of our faith, the barrel of the gun miraculously turned into a crucifix.